1 Paget, Gerald, The Lineage and Ancestry of H.R.H. Prince Charles, Prince of Wales, Vol. 1, Edinburgh and London: Charles Skilton Ltd (1977), 130. 2 Rietwiesner, William Addams, comp. and Christopher Challender Child, et. al., The Ancestry of Catherine Middleton , Boston, Massachusetts: New England Historic Genealogical Society (2011), 111. 4 The Official Website of The British Monarchy, "House of Windsor Family Tree", (accessed 11/30/2012). 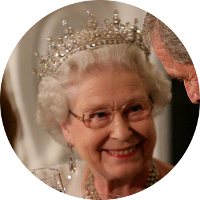 5 Wikipedia, "Elizabeth II", (accessed 05/11/2011).